Back on August 17, after our visit to the Diamond factory and our traditional return-to-civilization meal at the CN Tower, the boys and I crossed into the United States, cleared customs at the Buffalo airport and headed toward the eastern tip of Long Island, trying to make it to their cousin Freddie’s birthday party the following day. It’s amazing how being instrument rated changes my feeling toward the weather. It becomes all about staying comfortable, rather than worrying about “getting there.” When weather would get a little unfriendly before I had a way to fly into a cloud, I would worry about pressing on to get as many miles as I could toward my destination before I was forced to stop. Now I think about icing, turbulence, lightning… things that can really ruin your day. I make sure those risk factors are low, and then I concern myself with the comfort of my passengers. If the next morning it is only going to be cloudy, that will be a better time to fly. We were looking at a two and a half hour flight. The boys had been good all day (enough adventures for another blog entry), but they were a little tired of traveling. It was seven thirty at night by the time the customs officer was finished with us and I was able to close the plane up. I got them each a little bag of popcorn at the FBO (all FBOs have popcorn) and I set up the iBook for them to watch a movie. They picked out Lilo and Stitch and I said that once we were at cruise altitude they could fire it up. My plan was to fly pretty direct from Buffalo to the East Hampton airport. It was a little over three hundred nautical miles. 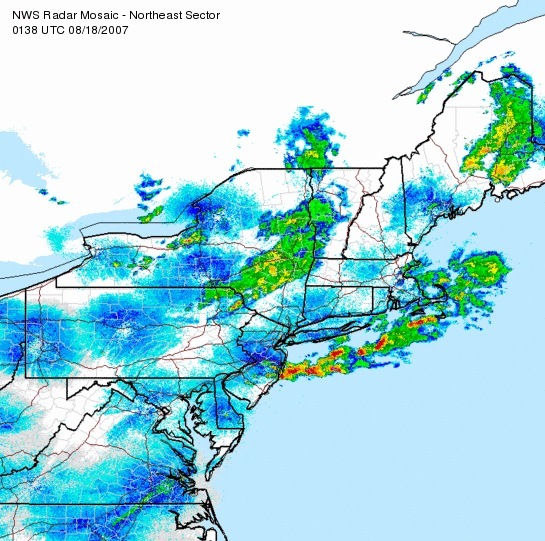 The radar on my laptop showed some thunderstorms moving across upstate New York, over Ithaca and heading southeast toward New York City. I knew that if I needed to I could put down anywhere in New York or Pennsylvania, get a cheap hotel and spend the night. I had also researched Caldwell, NJ, a small airport near New York City, and knew that I could land there, get a car service into Manhattan and stay at my parents’ loft for the night. We had options. There were a lot of Jetblue flights waiting in Buffalo to return to JFK. They were experiencing considerable delays. That meant that JFK, on the south shore of the western end of Long Island, was being slammed by storms heavy enough to stop the major airlines from landing. That wasn’t a good sign. Right after we launched, the weather was a little different than reported. It was a lower ceiling than I had hoped and the broken layer was really an overcast layer. Instead of cruising at 9,500 feet we’d be two thousand feet lower at 7,500. That was fine, it’s not like there were any significant mountains between us and East Hampton. In fact, compared to the west coast, the east coast didn’t offer any mountains to worry about at all. We had a tremendous tail wind. It was always more than twenty-five knots and often thirty-two. As we leveled out to cruise, the XM weather updated my NextRAD images and I saw the wing of storms ahead of us. I also saw the long, thin line of thunderstorms that were sitting directly over Long Island. The set nearer me meant that I would have to head south, further into Pennsylvania, to continue east. The thin line over Long Island meant that we would not be making it out to the Hamptons this evening. I took a moment to switch to the boys’ headsets and let them know. They were mostly interested in whether they could start the movie (yes) and where the water bottles were, since they had already started in on the popcorn. But they were disappointed that we wouldn’t make it to Freddie’s, a little less so when I said we’d fly out the following morning. I turned my attention back to navigating around the storms. Look at the radar image. That was an hour or so after we landed. You can see the set of storms that was pounding Long Island. The radar shows precipitation in color: blue is negligible, light green is minor, yellow is heavy and red is extreme. I don’t know what it is like to be in yellow or red. I’ve flown through a little light green and it was tap-tap-tapping on the canopy and was blown back in lines over the windows. It doesn’t interfere much with your enjoyment of moving through the sky. I would think that the heavy and extreme would make it difficult to hear and would include with some significant movement of air up and down. That’s the real danger of thunderstorms. The movement of the air inside (and around) the storm can be swift, fierce and powerful. It is not uncommon for small planes to report descents and ascents of several thousand feet per minute. If you are being pressed down by the wind the trick become steering out of it before you meet some part of the hard, hard earth below. Occasionally a small plane will fly into a storm, become totally disoriented, and in an attempt to control the plane the pilot will tear the wings off. So we stay away from thunderstorms. On the moving map I had in the plane, where I am watching an often-updated picture similar to that radar image here on this entry, I keep the plane at least twenty miles from anything green. The NextRAD is not instant (the most I have seen it delayed was eighteen minutes) and the storms are moving at about the speed of the wind. So we’re being chased by a 32kt wind, in eighteen minutes the storm can be ten miles closer than my picture shows. If I stay twenty away, I’ll never be in it. I’m also looking out the window all the time, so I should see a storm visually. I listen to ATC and they will talk to me about areas of heavy precipitation and reports that other pilots have made on the route ahead of me. As I ducked south around the fatter line of storms, I started to make my way east to KCDW (Caldwell). That was a waypoint on my journey out over the island. It was pretty clear that we weren’t going anywhere near Long Island, though. Not with all those storms covering it. I talked to ATC and asked how their picture looked. The very friendly controller said, “You’re not going to make it past New York City tonight. You’re the one up there flying the plane, but I’d say you should just take it as far east as you can tonight and set it down.” I told him to change our destination to Caldwell and he said that seemed like a good idea. We were getting bounced around. We were over the hills of western Pennsylvania and as the thirty knots of wind whistled over them they created waves of turbulence well past the seven thousand five hundred foot altitude we occupied. I kept the list of nearest airports up on the main display in front of me. I tightened my seatbelt so that a particularly sharp bump wouldn’t bang my head against the canopy. (There’s an amazing story about a pipeline pilot who was knocked out that way and survived the crash.) Whenever there was a series of particularly hard jolts I would glance at the nearest airport and figure how soon I would be on the ground. Then it would quiet down a little. I flew by hand because the autopilot doesn’t iron out the turbulence the way a human pilot can. As we came abeam of Scranton it calmed considerably (there’s a valley there, fewer hills for the wind to make bumps over). Just before it calmed there was a long string of bumps and I looked in the back seat to check on the boys. In the pitch black of the stormy night, as they were bounced through the sky on the shoulders of the wind running over the hills, their faces were lit by the light of the laptop’s screen and Rudy’s teeth flashed white as he laughed. They were both in hysterics over the antics of Stitch, the out-of-control alien adopted by a little Hawaiian girl. I couldn’t ask for better passengers. The flight was quiet now and it was only the visuals that were frightening. From sixty miles away I could see the huge storm over Teterboro airport, and at a similar distance storms over Newark airport and Elizabeth, NJ. Monstrous flashes of lightning would light up a third of the horizon. There was no thunder audible over the engine, wind noise and headset, but the light show was more than just impressive. The controller called from Scranton approach. “How is the ride?” I couldn’t complain, thirty knots of tailwind and a smooth sky. “Okay, checking in because winds were clam here ten minutes ago and we just had a squall line pass through. Fifty knots of wind gusting to sixty.” Well, that would be exciting. What direction was the squall line heading? “We couldn’t tell, it was just screaming from all directions.” Very professional, thanks. We buzzed onward into western New Jersey. The controller started vectoring me for the landing at Caldwell. I picked up the ATIS at the field and had the airport marked in my little Airport Guide. I started my descent. As I leveled out at 3,500 feet, closing the distance a little more to KCDW, I checked the weather page on the secondary display one more time. I couldn’t believe it, the line of storms had all blown out to sea. I confirmed with the controller, “It looks like we could fly direct from our present position to KHTO, the East Hampton airport. Is that right?” Let me look, he radios back. Yes, it has all blown clear. What would you like to do? “One Romeo Delta would like to change our destination to Hotel Tango Oscar.” He cleared us into the class Bravo airspace around La Guardia and I quickly plotted a course along the northern edge of Long Island. We flew over the Hudson and I pointed out the George Washington Bridge to the boys. They returned to their movie. When I had clicked over to their headphones to explain that we WERE going to make it to Freddie’s party after all, a cheer had gone up from the back seat. Now they just wanted to get there. Right after the rain, the air is really clear. That made for a gorgeous evening peering at the lights of the Island. The moon wasn’t up yet, and the water was dark, so the coast was the outline of the glittering lights against the blackness of the Sound. As we traveled east the lights were more scattered until there were large sections of what must still be farmland. I studied my Airport Guide, planned my descent, and began monitoring the common traffic advisory frequency (CTAF) at HTO, our destination. The controller let us go when we are ten miles from the airport and I started announcing our position. I flew over the airport first to orient myself and checked out the surroundings. It was all flat land. There were three runways, but only one had lights on it for a night landing. That’s fine, because the wind was nearly calm and it doesn’t matter which direction we land. I self-announced in the pattern, lined up for a very stabilized approach, and landed smoothly on runway two-eight. The three runways made a triangle and I had to taxi backward on runway two-two to get to the ramp and the FBO. As the plane pivoted the landing and taxi lights pinned two deer standing on the centerline, staring. The airport was deserted. My bother-in-law was on the way to pick us up, but there were no lights at all on the ramp. I had the little diagram from my Airport Guide, so I thought I knew where the terminal was. I sat for a moment after the engine stopped and gathered myself. It had been a little more than two and a half hours from Buffalo, close to three hundred fifty miles that in a car would have taken eight and a half hours without any traffic and clear weather. It had been a constant test of strategic navigation, risk management and airmanship. We climbed out. The boys were great helping with their bags and trooping about looking for a way off the field. I put the little metal chocks under the nose wheel, hoped that I was not parked in a bad spot, and followed them to the softly lit terminal.